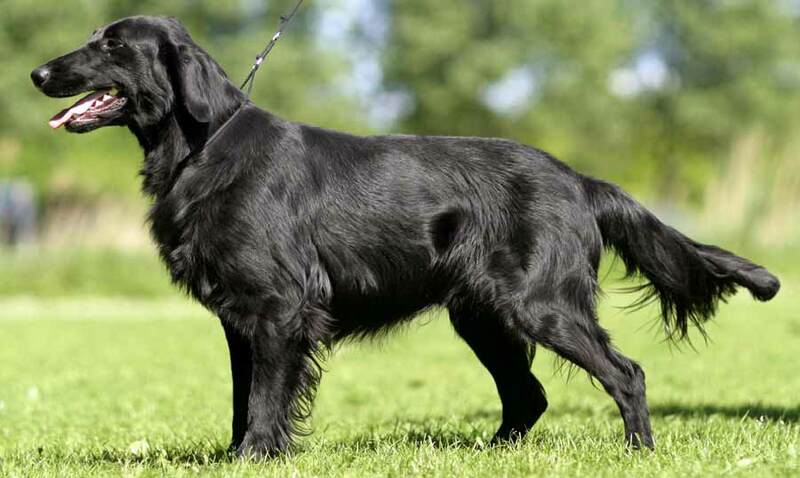 Flat-Coated Retriever is one of several retrieving breeds that were bred from the Newfoundland in the 1800s. Other breeds (including setters, spaniels, and even sheepdogs) were crossed with Newfoundlands to create retrievers who could retrieve on land and in the water. The term “Labrador” was used to describe just about any dog from this ancestry, not to be confused with the Labrador Retriever of today who shares this heritage. The Flat-Coated Retriever became a distinct type and then a breed in the late 1800s and early 1900s. The Flat-Coated Retriever is a large dog breed standing 22 to 24.5 inches tall and weighing between 60 and 75 pounds. She has a broad head, small dropped ears, and almond-shaped eyes. The body is strong, with a level back, and the tail is long and usually wagging. The coat is medium length, straight, and weatherresistant. The ears, chest, legs, and tail are feathered. The acceptable colors are liver and black. The coat should be brushed at least twice weekly to prevent tangles and mats. Many pet owners trim the ears, feet, belly, and under the tail for cleanliness. The Flat-Coated Retriever is a moderately active dog who is more than happy to conform to her owner’s wishes. She can go jogging, will walk nicely, loves to play on the agility course, and is a talented participant in field trials. The Flat-Coat just wants to do something, anything, with her owner. She can be a couch potato but will not be happy doing that for long; she is happiest participating in some kind of dog sports. A Flat-Coated Retriever is a breed who does everything well. They are friendly, smart, trainable, biddable, and birdy. They can do anything you want them to. This breed needs an actively involved owner. She can be great with children, although young dogs may be a little too rowdy for small kids. She is good with other dogs and with cats when raised with them. Health concerns include hip dysplasia; eye, knee, and thyroid problems; and bloat. Share your Flat-Coated Retriever story. Note: Upload only Flat-Coated Retriever picture or your picture with Flat-Coated Retriever below - spammer's ip may be blocked. This cheerful dog is athletic, not a couch potato, so he needs plenty of exercise — ideally exercise that includes swimming and fetching. Otherwise he will find outlets for his energy through destructive chewing and digging. The gregarious Flatcoated Retriever thrives on personal attention and doesn’t like being left for long periods of time without the companionship of people or other pets. He is eternally lighthearted and playful, doesn’t know his own strength, and can be an exuberant jumper. Supervision is important around toddlers and smaller pets. You must control his tendency to chew on objects and to mouth your hands — provide a box filled with toys so he can carry something around in his mouth. Obedience training is a must to instill calmness and good manners. Fortunately, he is responsive and biddable, though not as “push-button” as a Golden Retriever. He has a willful streak.